One of the original filtered little cigars to come out on the market, Santa Fe Filtered Cigars are one of Smokers Discounts more popular brands. 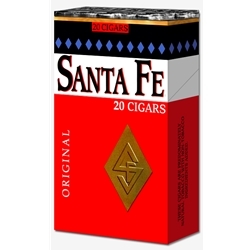 Santa Fe Filtered Cigars are rolled with the highest-quality blend of tobacco, naturally wrapped in a high-grade tobacco leaf for a slow elegant burn giving off a rich full-bodied flavor and aroma that is true to traditional smokes. Each of these discount little cigars are equipped with a longer filter and grooving that gives the Santa Fe premium filtered cigar brand a much smoother high-quality smoke than you’ll likely to find with any label purchased at a retail store. Santa Fe Filtered Cigars are distributed nationwide by Swisher International, Inc. located in Jacksonville, FL. USA. Each of these discount filtered cigars are available at our online tobacco store in 4 unique styles to choose from. Full Flavor, Smooth, Menthol, and Grape. Check out our online filtered cigar store for great deals and inexpensive ways to save money on over-prices retail brands. Here at Smokers Discounts we believe Santa Fe Filtered Cigars can be the right fit for your everyday smoking needs. Our online cigar store was created to make it easy and affordable to buy filtered cigars online. Call us for more details!